Last night we had a great dinner. 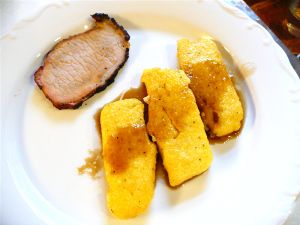 DH cooked a maple/sorghum-glazed pork loin on the grill; I made polenta and braised Brussels sprouts. It was more a fall than a spring menu, but it all sounded good so we went for it. Of course the pork was pink perfection thanks to the grillmeister, and the polenta was smooth, creamy and totally lump free. The secret? I made it in my microwave rice cooker. I have fallen in love with that device - it makes perfect rice and lump free, silky polenta - with virtually no stirring. I cooked the polenta, water and salt on high for 5 minutes, stirred it, then cooked it on medium-low (4 of 10) for 15 minutes. I stirred it again and cooked it for another 5 minutes on medium-low. 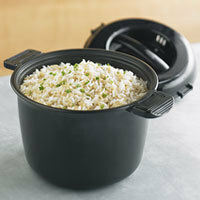 I need to buy another rice cooker for backup in case I somehow break the unbreakable plastic (if anyone can do it, I can). I scooped the leftover polenta into a plastic wrap-lined loaf pan. (A smaller loaf pan would produce more attractive corn meal mush slices.) The polenta chilled in the fridge overnight, and the next morning I sliced it into half-inch slices and fried it in vegetable oil. Bacon grease and/or butter would have made it even better, but I was trying to be nominally healthy this morning (what has gotten into me?!). It takes a while for the mush to get brown and crispy, but when it's finished, the mush has a crunchy shell covering silky smooth corn goodness. I made my own syrup from muscovado sugar, water and a touch of butter, although maple syrup is lovely too. Corn meal mush is a Southern treat I had never seen until I moved to West Virginia. I'm sure glad I was introduced to it. Those of you from the South are probably screaming "That isn't cornmeal mush!" and you are correct, but since I call polenta "Italian grits" I feel what I made was definitely in the spirit of cornmeal mush if not technically so. Traditional cornmeal mush is different in that the stoneground cornmeal used to make it is not as refined as the meal used to make polenta. I feel it's a quibbling difference, although born-and-bred Southerners may disagree. 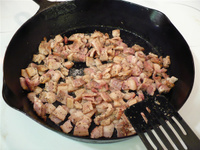 We ate the mush this morning with leftover pork. Pork is a meat perfect for all meals. All hail the pig! Things like this, discovered a food that I had never before seen, make me want to live in other cultures so I can absorb the culinary delights each has to offer. It would be wonderful to live in Thailand, China, Italy, Greece - just about anywhere, really - for a year so I could really get to know the secrets to great foods. Until I win the lottery I will have to settle for great cookbooks and television programs to discover interesting foods from across the globe. A friend dropped off a treasure the other day: fresh morel mushrooms that he had handpicked earlier that day. Now that's what I call a GOOD friend. 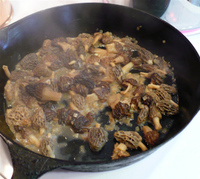 Morel season is fleeting; by the time this gets posted, they will probably be but a memory. Luckily, they will be a tasty memory. 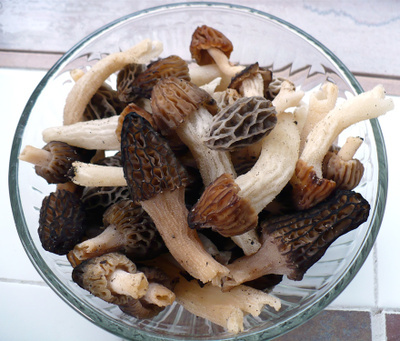 The past few years have been bad for morels - it's been too dry and too cold. The recent rains and warm weather were ideal for them this spring, though, and I am told it was a bountiful harvest. Last night's frost probably damaged any that were left, so I am glad we got them while the gettin' was good. If we ever get a farm, I hope it has tasty wild mushrooms we can harvest. If not, I will definitely try to transplant some, although I have no idea how difficult that is. My guess is that they grow wild in the right conditions, but that it is difficult to know exactly which area will be suitable if you are trying to propagate them. It's worth a shot at any rate. Orange You Glad I Didn't Fool You? Dating as far back as the sixteenth century, this classic British dessert has seen its popularity ebb and flow. 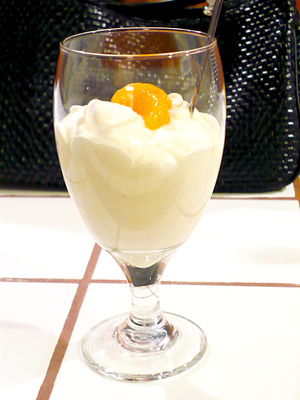 A fruit fool is made with cooked or raw fruit that is puréed or mashed, then sweetened, chilled, and finally folded into stiffly beaten whipped cream (there should be streaks of the white cream showing where the fruit has not been completely folded into the whipped cream). Traditionally fools were made with tart fruits such as raspberries, gooseberries, blackberries, loganberries, and rhubarb but today virtually any fruit can be used. "Fool" is believed to have originated from the French word "fouler" which means "to mash" or "to press". Until I came across the recipe in a magazine, I had never heard the term fool used to describe a food. But how can you go wrong with fruit and cream? Unlike the description from the Joy of Baking website, the recipe I followed indicated to completely fold the fruit into the cream, so my version is more homogenous than photos on the Joy of Baking site. Also, I didn't think to use a martini glass, which would have worked better than the goblets I used. But no matter, it tasted great. 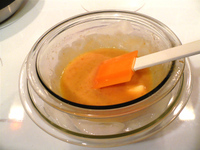 Another difference in the recipe I used versus other recipes I've found is that you make an orange curd instead of just using a fruit puree. 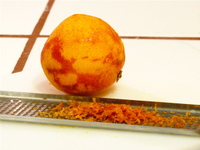 I used a navel orange plus a blood orange that was withering in the fridge drawer. The blood orange zest and juice boosted the color, and to enhance the flavor a bit more, I used a couple teaspoons of frozen concentrated orange juice. I could eat that stuff with a spoon! An orange fool is a Dreamsicle for adults. I adore the combination of orange and cream and Dreamsicles were a special treat when I was a kid. I suppose I could have "kicked it up a notch" by adding liqueur, infusing an herb or sprinkling in a spice, but sometimes simple is just fine. And speaking of cream, I've been thinking back to my days on the prairie in North Dakota, where in our very small town of 1,000 people there was a creamery. It's been closed for many years, but when I was little, my mother and I would take our plastic Tupperware jug, walk the two blocks to the creamery, and have the rich, thick, ivory cream ladled into our container from a large tank. Even as a kid I loved cream and I had to fight the urge to dunk my head in the tank and lap up the luscious liquid. Today's ultra-pasteurized, homogenized cream is a far cry from the heavenly substance found in that tank. Here's a tip to get the most out of the crap cream we have today. Don't beat it on high speed. I know it's faster that way, but I find I get more volume and a more stable whipped cream if I beat it on low speed. I have a good hand mixer with a whisk attachment, but this applies even to an old Sunbeam mixer with post-type beaters. Use low or medium-low speed. I use speed 2 out of 7 on my Cuisinart. I never bother to chill the bowl or beaters unless it's really hot in my kitchen and still have great success. By using a lower speed, I guess it gives the cream more time to set up, thereby incorporating more air. At least that's my theory. Last night I took half a cup of ultra-pasteurized cream that had been in the fridge for a month and it more than quadrupled in volume - I got over two cups of firm whipped cream. I also take the cream a bit farther than most people recommend - I go beyond firm peaks, until it almost starts to clump up for butter. There's a fine line there, but on low speed it's harder to over whip. By beating it a bit more I find it tends not to water out as easily and I've kept it for a few days without weeping. This is especially nice if you are using it as a pie topping. Besides being the perfect ending for All Fool's Day, it's an easy, delicious dessert that can be made any time of year out of just about any fruit. Zest the oranges and mince finely. 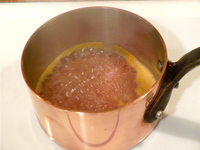 Squeeze 1 cup juice from oranges and in a small heavy saucepan simmer until reduced by half. In another bowl beat cream until it holds stiff peaks and fold in orange curd gently. It's preferable to have a few streaks remain. Spoon into martini glasses or goblets and garnish with mandarin orange slices and mint leaves, if desired. If you want to gild the lily, rim the glasses with orange tinted and flavored sugar. 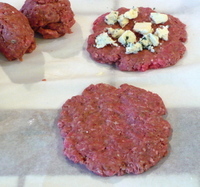 Before I get into the food processor wars, I want to briefly delve into a diversion about luscious burgers. After needlessly ruining many a burger in my youth by overcooking, underseasoning, and a multitude of other sins, I think I finally have a great burger recipe. It involves an unusual ingredient and interesting assembly procedures, but many of my friends say it’s the best burger they’ve eaten. I start with ground chuck. If your burger looks fattier than mine in the photo below, you might want to cut back a little on the next two ingredients. To this freshly ground chuck, I add some butter and peanut butter. I’m not going to publish the actual measurements in case I want to enter this burger into a competition sometime. 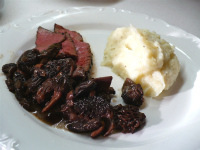 Most competitions clearly state that the recipe cannot have been published prior to entry in the contest. You can see this is not health food, by any means. Salt, pepper and a bit of special sauce (OK it's Worcestershire) round out the patty ingredients. Not terribly complex, but when you are starting out with good meat, you don’t need to embellish that much. One of the problems I have with many burger concoctions is there are too many ingredients – eggs, breadcrumbs, tons of seasonings. You might as well just make meatloaf. I form the burger into balls. Each ball is patted pretty thin. To half the balls I add cheese – whatever kind you like is the right kind to use. I have used cheddar, blue, pepper jack and Colby jack with excellent results. I put the two halves together and let my husband, the Grillmeister, work his magic. The end result is pretty darn tasty. 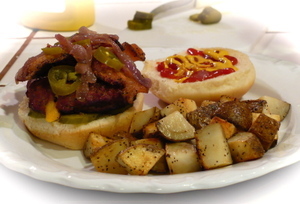 Oh, and those things that look like dead worms on top of my burger are sauteed red onions. I'm no Andrew Zimmern. Yesterday I took a mental health day to regroup. I needed to chill since I have been running around like the proverbial headless chicken for weeks. First I missed work due to a nasty cold, then I got inundated with tasks when I returned. I needed a day to reflect and relax. While I was taking stock and catching my breath, I decided to make stock. For quite some time I was in the habit of making my own chicken and beef stock, but I got lazy (I would say busy, but then again I'm always busy) and stopped for about a year, relying instead on canned broth. However, after reading Michael Ruhlman's impassioned pleas to either use homemade stock or just plain ol' water, and never to use canned stock with all of its tinny, chemical tastes, I decided he was right - homemade stock is miles beyond the canned stuff and I needed to make it again. A bag of chicken backs at the butcher's last week got me started, and now I'm on week two of stock making. Last week it was chicken and beef, this week just chicken. The process for stock making could hardly be easier. I don't know why I stopped in the first place. If your grocery store doesn't cut its own chicken to have extra backs and necks, buy some wings, drumsticks or thighs on sale and use those. 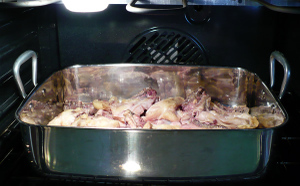 The extra meat in the thighs and drumsticks will add flavor, even if you will be spending more. But if you have a butcher or grocer who cuts up chicken, just ask them for the backs and necks. I get mine for 29 cents per pound, which actually makes it cheaper to make my stock than to buy the canned stuff. Beef stock ends up being more expensive, but it is loads better. I almost always make a brown stock, so named because the meat is roasted first to impart flavor and drive out impurities. The chicken pieces (which I probably should have cut up into smaller bits) went into the oven for about 40 minutes until they were golden brown. My cat kept watch at the oven to make sure the chicken didn't escape. After roasting, I put the parts into a 12 quart stockpot and just barely covered them with water. Some people say they can't make stock because they don't have the equipment. This is utter nonsense. If you don't have a large stockpot, you can use a smaller pot with less meat, but the end result will be the same. It will be more effort per pint of stock, but not having a big pot shouldn't stop you. Also, you can pick up an inexpensive pot to use if you have space to store it. I think mine cost $25, and that included a colander and lid. I put the pot on to a low simmer for about 3 hours. When I say low simmer, I'm talking 195 to 205 degrees. A bubble or two should emerge every few seconds, but the stock shouldn't boil. If it boils, the stock will still be usable but it will be cloudy. It's mostly an aesthetic thing, although some folks say the flavor is compromised too. I say if it boils a little, oh well. That happened to me last time because I didn't watch it when I was getting it up to temperature. This time, though, the stock stayed at the right temperature and the result is pure liquid gold. After around 3 hours, I put in some aromatics to add flavor. I used parsley, thyme, onion, carrot, celery and garlic. Some people don't use garlic, some people add different herbs, and it's all good. The beauty of stock is that you can play with it, and you don't have to follow to hard and fast rules. I would usually use more onion, but that's all I had available so I didn't worry about it. Another nice thing is that you don't have to finely chop anything or peel the vegetables. They do have to be cleaned, of course, but then a few chops and it's ready to go. I let the vegetables simmer for about an hour, then I strained the entire batch into a large bowl. I remember the first time I made stock. I was intently reading the recipe and saw that it said to strain it, so I set the colander in the sink. I didn't notice that I was supposed to strain it into a bowl, so I poured it all down the drain. Aarrrggghhhh! What a disappointment (not to mention an embarrassment). 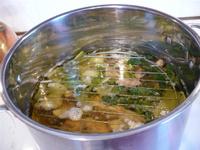 Once you are finished with the stock, you need to cool it rather quickly to avoid any nasties growing in it. I have a method that has it ready for the fridge in 15 minutes. I use a thin stainless bowl that easily conducts the heat. 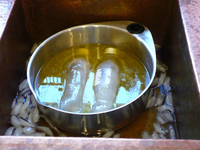 The bowl is placed into the sink which has several inches of ice water in it. Finally, and I believe most importantly, I put two frozen bottles of water in the stock and stir those around. It's hard to tell from the photo, but I am an equal opportunity bottle freezer. One of those was Pepsi, the other Coke. Any plastic bottle will do. I've cleaned and reused those bottles for about three years. 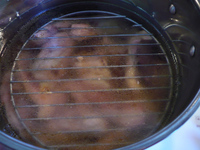 The stock came down from about 195 degrees to 65 degrees in 12 minutes. How's that for quick cooling? After the stock chills and the fat congeals at the top, ready to be skimmed (and used to fry potatoes! ), the stock is ready for soup. I can also reduce this stock (by cooking it until much of the water evaporates) and use it in sauce making. You'll notice I didn't add any salt, so that I can reduce this stock down to gelatinous goo without it becoming salty. However, since I don't make a lot of sauces, I usually just freeze the stock as is in freezer bags to use in soups. And boy, does it make a difference there. I made French Onion Soup with the beef broth I made last week, and it was just divine. 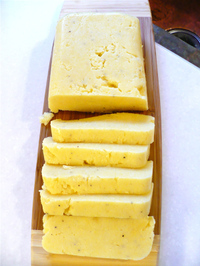 Making the knephla soup a few days ago, and researching the etymology of the word knephla, got me thinking about kase knephla (kay-za nep-fla), aka cheese buttons. 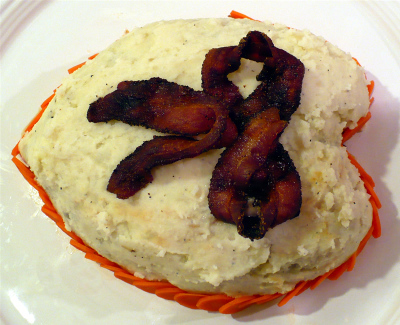 Our family often served these on Lenten Fridays because they contain no meat. You must understand that in our family, a meal without meat was like a day without oxygen. After all, my grandfather raised cattle, my grandmother kept chickens, and my uncle raised pigs. I never saw a leek or asparagus until I moved away from home, but I was familiar with the various meat cuts and innards of every barnyard animal. 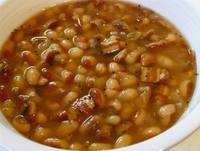 Kase Knephla was one of my favorite Lenten meals. I make them nearly the same as my grandmother, although I do add chopped parsley for a boost of flavor and a little color. Cheese buttons, as I will hereinafter refer to them since I know it's probably difficult for you to keep trying to say knephla in your head, are basically a German ravioli - an egg dough filled with cheese, onion and spices (well, salt and pepper anyway - that constitutes the majority of spice used in my family's cooking), boiled until the dough is cooked. 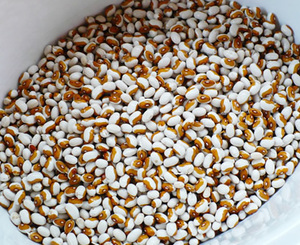 After they are boiled, they are usually fried in butter with bread cubes. 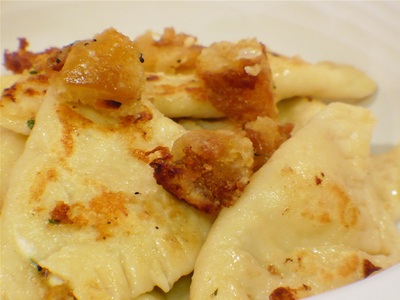 Maybe that makes them more like pirogi. Whatever you liken them to, they are quite tasty. One quirk about this recipe that I'm sure will make many cooks cringe is that the filling contains raw onion. Almost every recipe I come across with onion in a filling instructs you to saute the onion first. But the sharp taste of the raw onion contributes to the traditional flavor of the filling. If you think that raw onion would be too pungent, I'm sure scallions would be an acceptable substitute. Our family recipe calls for dry curd cottage cheese. That product is particularly difficult to find these days, unless you live in an area with a significant Jewish or ethnic German population. I don't even know if you can find it in my hometown anymore. I just used regular cottage cheese that I drained in a wire mesh strainer for about half an hour. I should have whizzed the drained curds in the food processor but I was just too lazy. I've read that fresh ricotta cheese is a good substitute for dry curd cottage cheese; however, I can't find that here either. So I just made do, which is what any good German grandma would do. I used the food processor to make the dough, which is something that German grandmas don't usually do. In fact, I think I'm the only family member who even owns a food processor. (Me and all my newfangled contraptions) This dough is quite like an Italian egg pasta, but instead of adding eggs to the flour until you achieve the right consistency, you use a set amount of egg and make up the rest of the liquid required with water. 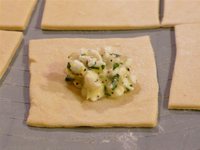 A plop of filling goes on each square, which is then folded into a triangle, the edges sealed and the buttons boiled until the dough is tender. The recipe says that takes 15 minutes, but I feel 7-8 minutes is more appropriate for a fresh pasta. I never get all the edges perfectly sealed so, as with any filled pasta, there is always the danger of leakage. I've found that having the water at a lazy boil mitigates this danger. I allow the water to come to a full, rolling boil, but turn it down and let it mellow before dropping in the buttons. Then I monitor the boiling fairly carefully, making sure that it maintains a boil, but just so. This time I didn't have any big explosions, so my theory seems to be validated. As the buttons neared the end of their boil, I heated some butter in a wok (it's m y favorite pan for frying stuff since it's so well seasoned). I threw in some fresh bread cubes to fry first (WRONG! I was supposed to add them last, but I screwed up). 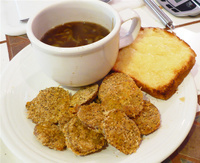 After the buttons were boiled sufficiently, I pulled them out of the water and added them to the butter and bread cubes. The bread had soaked up most of the butter so the cubes were a bit soggy. Next time I'll remember to add them last. Even though I didn't do it last night, I recall eating these with ketchup as a kid. I hope the culinary gods will forgive me for that transgression. Bring several quarts of water to a boil and salt to taste. Mix flour, 1 tsp. 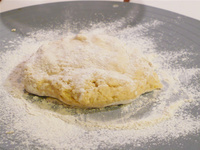 salt, 2 eggs and water to make a firm dough. Divide into 3 parts. Roll very thin; cut into squares, about 3 inches. Mix remaining ingredients together and spoon onto squares. Wet edges of dough and fold over to form triangles. Seal edges with a fork. Add buttons to water and boil gently for 7-8 minutes or until dough is tender. 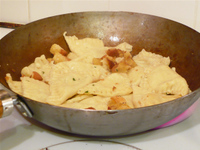 Melt a few tablespoons butter in large skillet or wok on medium heat. 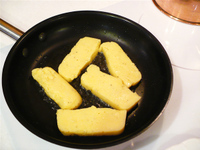 Increase heat to medium high heat and fry buttons for several minutes or until browned in spots, adding bread cubes toward the end of cooking. How do you say 'I love you?' With meat, of course. As for me, I received both excellent chocolates AND a gorgeous bouquet of tulips and wildflowers. And he did the dishes - what more could I ask for? Here's a slice of the cake. Sorry the plate is so messy, but that was actually my second piece. I was too hungry for the first piece to take a photo. 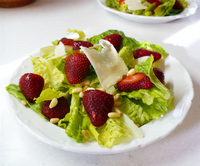 Now my attention will be turning to a surfeit of strawberries. I let the intoxicating aroma of REAL, FRESH strawberries get to me and bought a flat (12 pints). I'm testing out some of those Debbie Meyer's Green Bags with these. She claims that the bags will keep produce fresh up to 30 days. So far I am pretty impressed. I've had a bunch of Gala apples in a bag for two weeks, and they are as firm and unblemished as the day I put them in there, and they've been hanging out in the fridge where they usually get dried and wrinkled. Last night we put some strawberries to good use in margaritas and we enjoyed a luscious fruit salad for breakfast this morning. Strawberry Cream Cake is on the agenda, and strawberry shortcake has been requested too. Strawberry shortcake is one of the few things I cheat on. I don't like the biscuit-y type recipes, and found a little round sponge cake in the Kroger bakery that doesn't have any artificial flavorings or unpronounceable ingredients. So I use those moist, tender vanilla cakes with some freshly whipped cream and strawberries tossed with just a bit of dark brown sugar, and it is as tasty as it is easy. I think that's is what we having tonight, because the strawberry cream cake is a lot more work. Any suggestions you have for these strawberries will be welcomed. Whatever I don't use in a recipe will go into a freezer jam if they start to get dodgy, but I'd like other ideas!